From start to finish, about 35 minutes. Lemony deliciocity. When we think of hollandaise sauce we usually think of brunch at a restaurant with friends and a Caesar cocktail or two. That’s a pity because making that wonderful lemony sauce isn’t really all that difficult, and can be done very successfully by anyone able to handle a whisk. Mortal fear of “that sauce” seems to be the major holdback from serving “eggs benny” at home. Hopefully this post will inspire you to try it. This isn’t strictly Eggs Benedict, but it’s close. I had some ingredients at home that shifted my recipe, somewhat. Ingredient 1: My mother – bless her – always gives me eggs when I go to visit her. What that means is that my refrigerator usually has a glut of them. We don’t eat very many eggs in our household. They had to be used. Ingredient 2: Asparagus is flooding the grocery stores (and is affordable) right now. I had purchased some for something else, but I changed my mind. So I had asparagus hanging around. Ingredient 3: I made French bread yesterday, and it’s only “fresh” for one day. Day-old French bread is a perfect candidate for toast. So that was my “leftovers,” begging to be used. My actual shopping list for this meal therefore consisted of 1 lemon and a few slices of ham. Not bad when you consider this can feed four. I have to admit, I didn’t eat this for brunch. It was dinner, so I increased the portion size. Tsk, tsk. Roasted asparagus is a marvellous thing. It brings out the sweetness and adds a layer of smokiness that isn’t there when it is steamed or blanched. It’s a great way to eat it. As far as the hollandaise… I changed a couple things. First, I made it a little more lemony than a classic version. That just makes it more wonderful in my book. Another thing I did was simplify the method to make it. 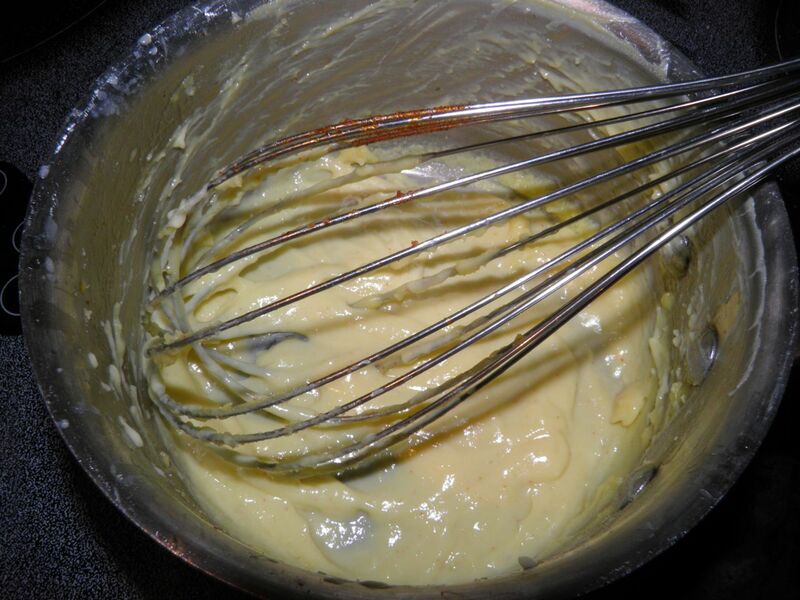 Classic hollandaise requires a “bain marie” (a hot water bath) that the eggs are cooked over. Fussy, and as I discovered unneccessary. 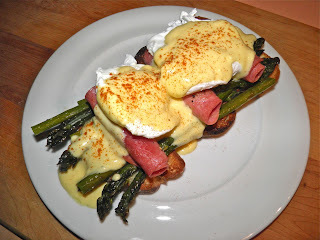 You have to have the courage of your convictions to make hollandaise right on the stovetop element, but it can be done. Just don’t be scared. In a like situation James Beard said “the only thing that will make a souffle fall is if it knows you're afraid of it.” The same is true of hollandaise. Don’t be afraid of it. It’s only a sauce, and what’s the worst that can happen? I don’t think failed hollandaise is an indictable offence. There are several variations in Eggs Benedict all with different names and ingredients. I couldn’t see one listed that used asparagus. I find that odd, because it is such an obvious choice. This recipe put a dent in my egg count, which is a good thing. If you want to have a delicious, and quite simple although a little involved, lunch or dinner, try this. You don’t have to make your own bread, but it doesn’t hurt! Place the 1/4 cup butter in the bottom of a pan and melt it in the oven. Roll the asparagus spears in the butter and arrange in one layer in the pan. 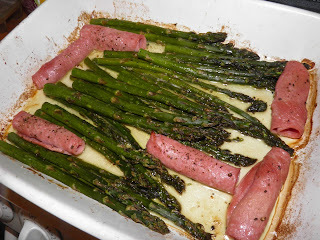 Roll the ham slices and place among the asparagus spears. Sprinkle with salt and pepper. Bake for 30 minutes. The asparagus will be slightly darkened and able to be pierced easily with a fork. The ham will retain its rolled shape as well. 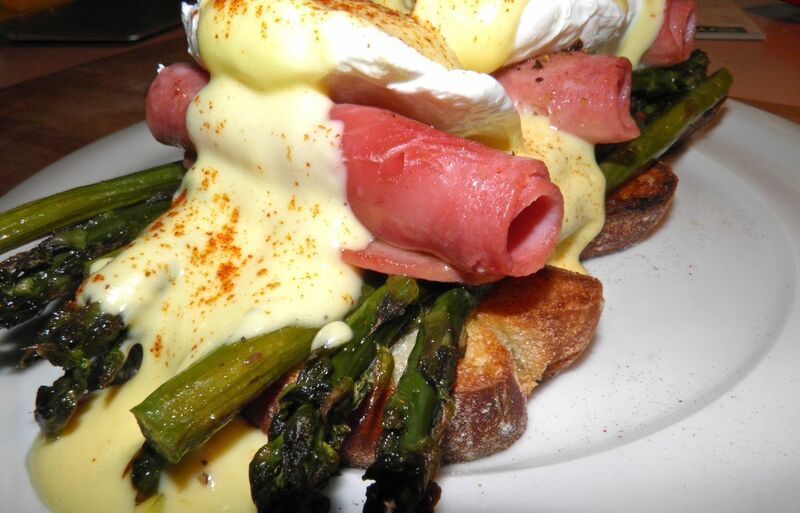 While the ham and asparagus are baking, make the hollandaise sauce and poach the eggs. To assemble, place 2-3 slices of buttered toast on a plate. Place 1/4 of your asparagus spears on the toast and one roll of ham per piece of toast. Then top with two of the eggs. Spoon some warm hollandaise on top and dust with a little cayenne pepper if desired. hollandaise, a full 3/4 of an hour after it was made. Still fine. Melt the butter and keep it warm. In a small saucepan combine the lemon juice, water and egg yolks. Whisk well. Place the saucepan over medium high heat. Whisk constantly until the mixture becomes frothy and thick. Reduce the heat to simmer. Slowly start incorporating the melted butter, still whisking vigorously. The mixture will continue to remain thick. If it thins too much, add another yolk. When all the butter is added remove the pot from the heat. Stir in the cayenne and salt.